Designed for Sony’s full-frame A-mount DSLT models and compatible with the APS-C bodies with the usual 1.5x crop to the field of view, the original Zeiss-branded, Sony-made 16-35mm f2.8 ZA SSM had an excellent reputation for image quality, even if somewhat heavier, bulkier, and pricier than rival offerings. This new mark II version features the same 17-element design with three ED and one Super ED glass element, and focuses down 0.92’ (28 cm), but image quality has been enhanced with improved T* (pronounced “T-star”) coatings to reduce ghosting. 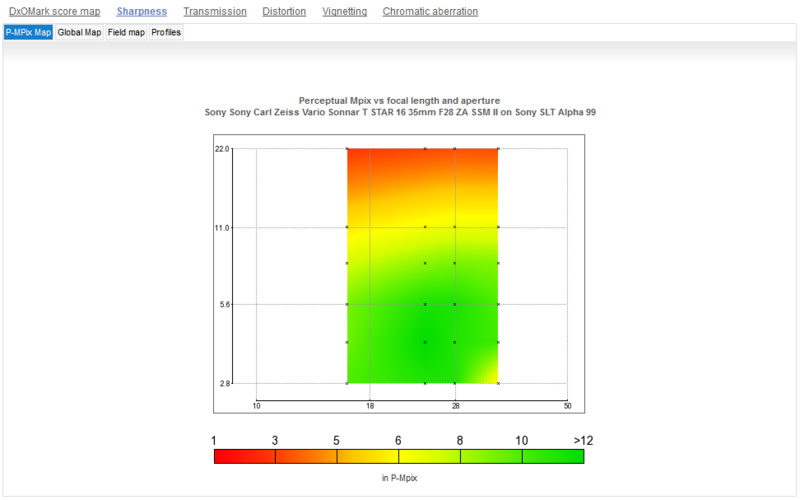 In addition, Sony also claims the AF performance has improved by adopting faster in-lens processing, delivering improved accuracy and up to four times the tracking speed of its predecessor. And in a move designed to appeal to landscape photographers, the new lens has a dust- and moisture-resistant design, although it’s not clear how this differs from the original. The new model measures 3.27 x 4.49” (83.0 x 114mm) and weighs 30.8 oz (873g). It is available now at around $2,250 (USD), $250 more than the original. 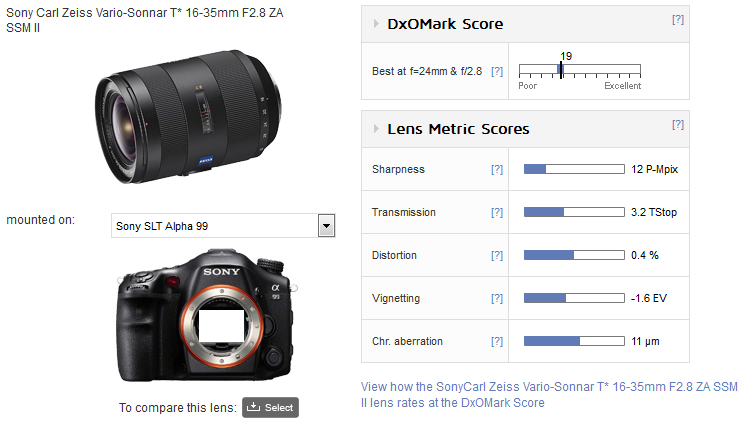 Achieving an overall DxOMark lens score of 19 points on the full-frame 24-Mpix Sony SLT Alpha 99, the updated model performs well, though the ranking in our database is affected by the sharpness scores, and as result is lower than you might expect. 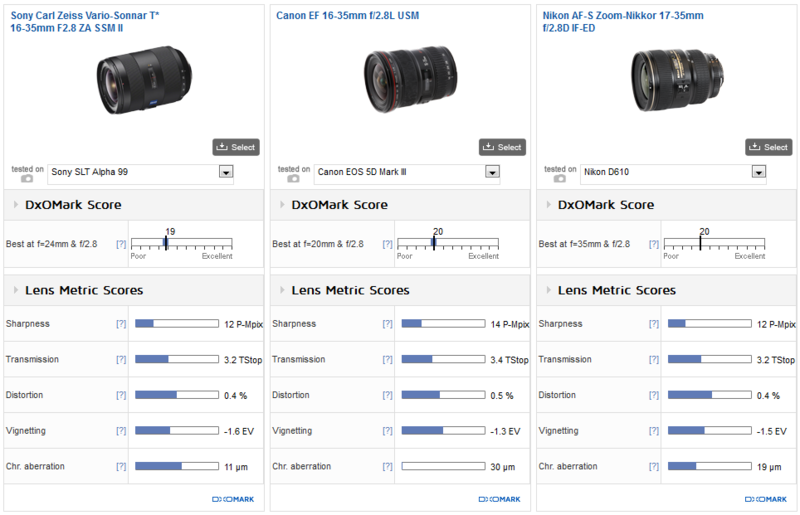 Lenses aren’t tested on their own, however, and the overall score is a combination of the sensor and lens performance. Sharpness levels are high for a wide-angle zoom like this, particularly in the centers. 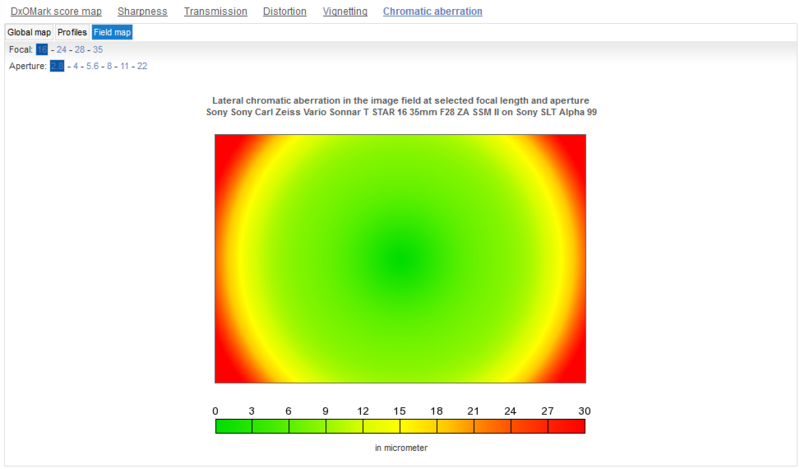 At 16mm, high levels of chromatic aberration and some slight astigmatism limit sharpness in the periphery, while some field curvature is noticeable at the longer end. Central performance is good, however, at all focal lengths, and improves steadily across the field when stopping down over the 24-35mm zoom range, with optimum performance reached at f/8. Barrel distortion changing to pincushion at longer lengths is typical on a lens like this, but the barrel distortion borders on mustache type that can be difficult to correct in post-production. Also, there’s fairly high vignetting at 16mm. 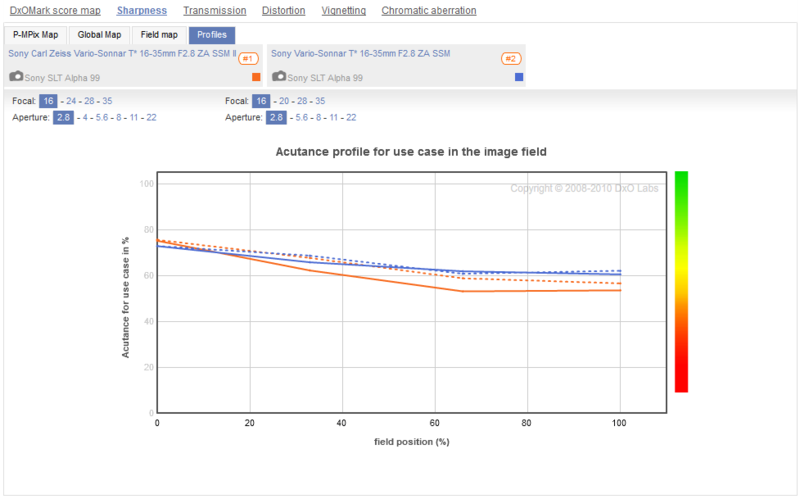 All these factors degrade image quality at the wide setting, but overall the lens is very high performer. 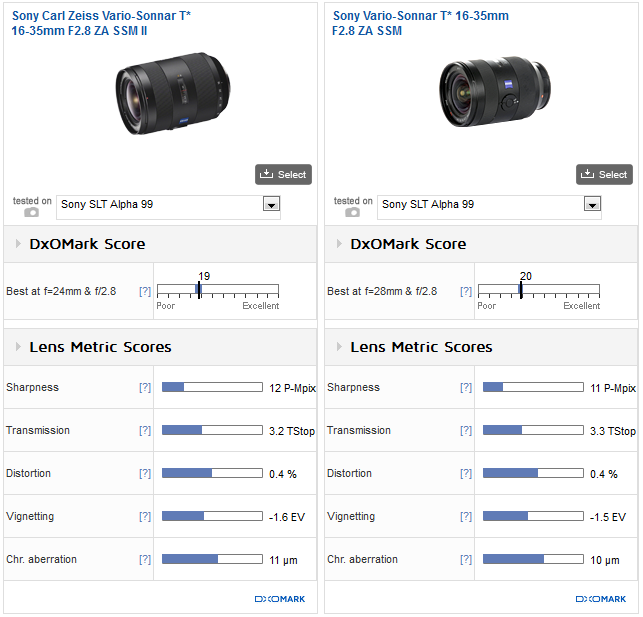 With similar DxOMark lens scores overall, the new lens performs similarly to its predecessor, although when examined more closely, our measurements differ, mostly for sharpness (acutance) levels, but also for transmission and vignetting, albeit to a much lower degree. At the extreme ends of the zoom range, sharpness levels have dropped in the outer field at wider apertures, although the effect is reversed slightly at mid focal lengths, and the differences lessen when stopping down (except at 16 mm). Although it could be due to the new coatings, we can’t rule out sample variation. 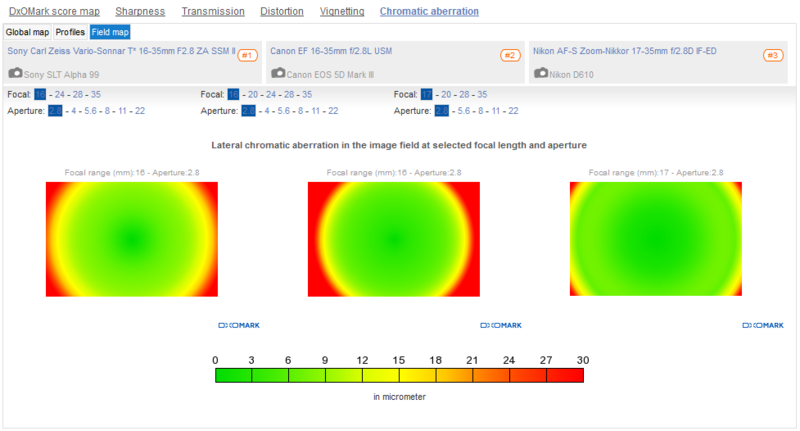 Overall the two lenses perform similarly in the lab, though we do expect the new coatings to be more effective under less-than-ideal conditions. 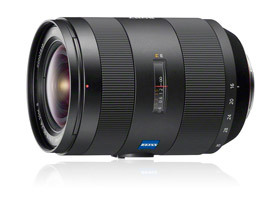 The Sony compares well with rivals, and is on equal footing overall with both the Canon EF 16-35mm f2.8L USM on the 22-Mpix EOS 5D Mk III, and the aging Nikon AF-S Nikkor 17-35mm f2.8 IF-ED mounted on the 24-Mpix D610 (this lens is mostly replaced now by the AF-S Nikkor 14-24mm f2.8 ED). Although the Sony has the best performance of the three wide-open (even with the Canon just ahead at 16mm), and has a good solid central core of sharpness throughout the zoom range, it can’t match the consistent sharpness across the field of the Nikkor once stopped down, or the peak sharpness levels of the Canon. However, the Canon has very high levels of LCA at 16-20mm and higher barrel distortion. The Nikon has high measured values of LCA as well, but even though it’s limited to the extreme corners (unlike the Canon and the Sony), it’s not a match for sharpness until it’s stopped down to f/5.6-8, and even then, performance is lackluster at 35mm. New coatings rarely bring improvements under ideal conditions, such as those found in the labs, but it’s good see Sony update premium lenses like the Zeiss 16-35mm f2.8 ZA SSM II. Even if it’s just a minor upgrade, it’s more than either Nikon or Canon have done with their models, at least as far as we know. 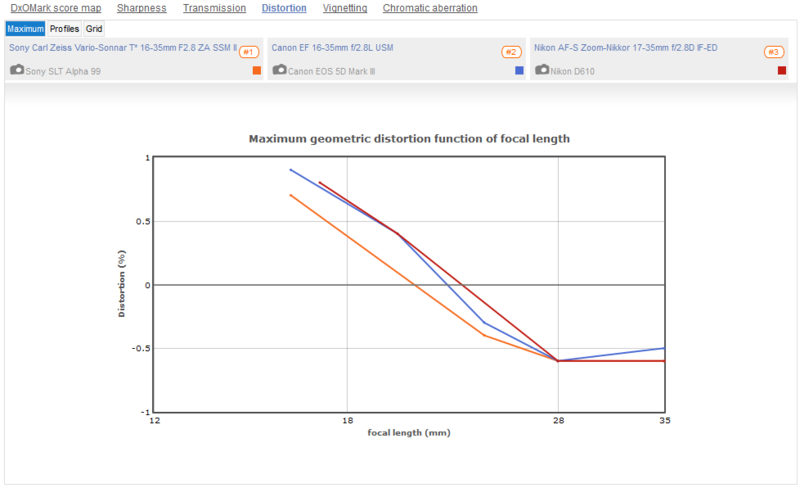 While there isn’t any real improvement in our lab tests, the Zeiss 16-35mm f2.8 ZA SSM II remains a competitive model in terms of optical quality, although at well over $2,200, it’s even less accessible now than its predecessor.